The global contraceptives market is growing at a fast pace in the last few years, thanks to the ardent efforts that are being taken by the private as well as public organizations for creating an awareness for using contraceptives. The introduction of several contraceptives drugs and the devices is estimated to accelerate the market growth in the coming few years. In addition to this, the enhanced distribution network of the global contraceptives market is likely to further enhance the development of the market in the near future. The rise in the prevalence of sexually transmitted diseases and the growing focus on technological advancements are considered to encourage the growth of the global contraceptives market in the next few years. In addition to this, the rise in the NGO and government initiatives in order to promote the use of contraceptives are further anticipated to supplement the development of the market in the next few years. On the flip side, there are several side effects that are related to the use of contraceptives drugs and the growing prevalence of infertility are estimated to restrict the development of the contraceptives market in the near future. Nonetheless, the rising research activities and innovations in this field are likely to offer strong growth prospects for the key players in the near future. From a geographical viewpoint, North America is anticipated to account for a massive share of the global contraceptives market in the next few years. The increasing prevalence of unintended pregnancies and the increasing use of contraceptives among the teenagers are the most important factors that are estimated to enhance the growth of the contraceptives market across North America. In addition to this, the rise in the trend of delayed child bearing is another aspect, which is likely to boost the demand for contraceptives in the next few years. Europe is estimated to remain in the second position, thanks to the enhanced distribution network that allows easy availability of contraceptives for consumers. Furthermore, the rising consumer awareness and the rising population, especially in China and India predicted to support the growth of the contraceptives market in Asia Pacific. At present, the global contraceptives market is characterized with a high level of competition with a presence of a large number of players operating worldwide. The market is expected to witness an entry of several new entrants in the coming few years, thus strengthening the competitive landscape of the market in the near future. In order to enhance the market penetration, the leading players are focusing on creating an awareness among people related to the benefits of contraceptives. In addition to this, the rising expenditure on advertising strategies and marketing activities is predicted to encourage the development of the global contraceptives market in the next few years. 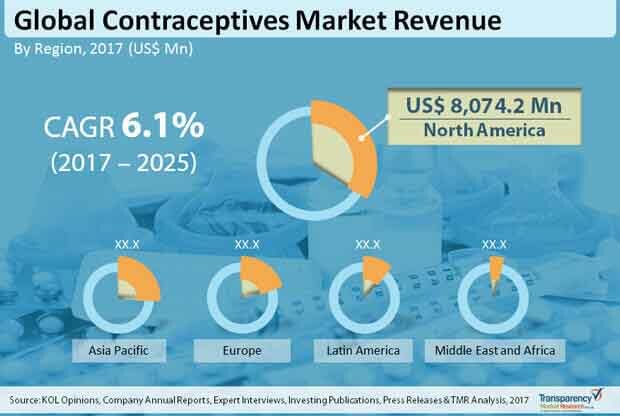 The key players engaged in the global contraceptives market are Merck Co. Inc., Bayer AG, Teva Pharmaceutical Industries Ltd., Pfizer Inc., Allergan plc, Janssen Pharmaceutical Company, Mankind Pharma, Mithra Pharmaceuticals, Cipla Inc., HLL Lifecare Limited, and Reckitt Benckiser plc. The contraceptive market report comprises an elaborate executive summary, which includes a market snapshot that provides information about various segments of the market. It also provides information and data analysis of the global contraceptive market with respect to the segments based on product type, distribution channel and geography. A detailed qualitative analysis of drivers and restraints of the market and opportunities has been provided in the market overview section. In addition, the section comprises porter’s five forces analysis and value chain analysis to understand the competitive landscape in the market. This section of the report also provides market attractiveness analysis, by geography and market share analysis by key players, thus presenting a thorough analysis of the overall competitive scenario in the global contraceptive market. Based on product type, the contraceptive market is segmented as contraceptives drugs and contraceptive devices. The contraceptive drug is further segmented into oral contraceptive, contraceptive injectable, and topical contraceptive patch. Oral contraceptive is further segmented into combined contraceptives and mini-pills. Contraceptive devices is segmented into male contraceptives and female contraceptives. Female contraceptive is segmented into female condoms, contraceptive diaphragms, contraceptive sponges, contraceptive vaginal rings, intrauterine devices, sub-dermal contraceptive implants, and non-surgical permanent contraception devices. The product market segments have been analyzed based on available drugs and devices, product pipeline for new contraceptives products, cost-effectiveness, and preference for contraceptive product among population. The market size and forecast for each of these segments have been provided for the period from 2015 to 2025, along with their respective CAGRs for the forecast period from 2017 to 2025, considering 2016 as the base year. Based on distribution channel, contraceptives market is segmented into hospitals pharmacy, independent pharmacy, online platform, clinics and others. The market segments have been extensively analyzed based on availability of different contraceptive products, availability of these products at different distribution channels and geographical coverage. The market size and forecast in terms of US$ Mn for each segment have been provided for the period from 2015 to 2025. The report also provides the compound annual growth rate (CAGR %) for each market segment for the forecast period from 2017 to 2025, considering 2016 as the base year. Geographically, the global contraceptive market has been categorized into five major regions and the key countries in the respective region: North America (the U.S., Canada), Europe (the U.K., Germany, Russia, France, Spain, Italy, and Rest of Europe), Asia Pacific (Japan, India, China, Australia & New Zealand and Rest of Asia Pacific), Latin America (Brazil, Mexico, and Rest of Latin America) and Middle East & Africa (South Africa, GCC countries and Rest of Middle East & Africa). The market size and forecast for each of these regions and the mentioned countries have been provided for the period from 2015 to 2025, along with their respective CAGRs for the forecast period from 2017 to 2025, considering 2016 as the base year. The research study also covers the competitive scenario in these regions. The report also profiles major players in the global contraceptive market based on various attributes such as company overview, financial overview, product portfolio, business strategies, and recent developments. Major players profiled in this report includes Merck & Co., Inc., Cipla Inc., Allergan plc, Bayer AG, HLL Lifecare Limited, Mankind Pharma, Pfizer, Inc., Teva Pharmaceutical Industries Ltd., Mithra Pharmaceuticals, Janssen Pharmaceutical Company, Reckitt Benckiser Group plc., and others.